Count me among the fans of the effort to make Admiral Ackbar the new mascot of Ole Miss. The old mascot was "Colonel Reb," who often would ride around in confederate regalia. There's no excuse for making mascots of people who went to war so that they could keep what's now 37% of the state's population as slaves. The "Rebel Alliance" interpretation of the whole "Rebel" concept takes Mississippi out of the horrific past and into the awesome present/future,/long ago in a galaxy far, far away. 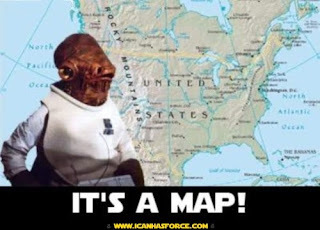 I'd have a hard time rooting for a team whose mascot was all about the Confederacy, but I'll definitely cheer for Admiral Ackbar. It's probably not going to succeed and I imagine there would be serious copyright issues. But still, cool. One can only hope that George Lucas is properly understanding of just how great a force his movies are in our culture and is willing make allowances as such. Maybe he can think of it as free advertising. Can we also have Jabba the Hut made the new mascot of the Republican party?